One of life’s rites of passage — whether right or wrong — is getting that first credit card. When used properly, a credit card can help you create a good credit history that will serve you well when it comes time to buy a car or a home. When used irresponsibly, though, credit cards can result in debt and despair. One of the things you can do to encourage good credit habits is to choose your first credit card wisely. Who Can Get a Credit Card? While some credit card issuers may be flexible on the “proof” of ability to cover credit obligations, you are still likely to have a more difficult time getting your first credit card than young people did before the Credit CARD Act. But, even so, it still helps to be picky about your first credit card. One good way to get your first credit card is to establish a banking relationship. Open an account at a bank or credit union, and start using it. A savings account is a good idea, but you want to make sure you have a checking account as well. Use the debit card with your checking account wisely, and you will show your level of responsibility. After six months or so, if you have proven yourself, you can go in an ask about getting a credit card. A credit card issued by your local bank or credit union is likely to be of the no-frills variety, with a fairly low credit limit, but will probably have a decent enough interest rate. Once you show that you can manage your credit responsibly, paying off the card each month, you can get an increase in your credit limit, and you will see other credit card offers, with more attractive terms. Reasonable interest rate: As someone without a credit history, you will have to pay a little bit higher interest rate. That is to be expected. You might compare student credit cards, since they offer rates that are comparable for credit history. If you have some history, such as a car loan, or a student loan, than you have been making payments on, you might be able to qualify for a slightly lower rate. No annual fees: Make sure your first credit card does not come with annual fees, or with application fees. 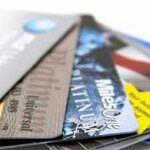 Consider rewards: Many credit cards come with rewards programs. Before you choose a card, make sure the program is something you will use. Don’t choose a travel rewards card if you are unlikely to use your airline miles. If possible, choose a flexible rewards program that allows you to use your points on a variety of options. Some student cards also offer rewards points for engaging in responsible behaviors, such as making your payments on time. Penalties: Some credit card issuers are starting to mull the idea of charging inactivity fees and similar penalties. Look for a credit card that will not charge you just because you haven’t been using the card. Also, compare fees like late payment, over the limit and cash advance fees. Introductory rates: Many cards offer introductory rates. Make sure that you understand when that plum rate ends, and be prepared to have purchases paid off by then. Another possibility is to start out with a secured credit card. However, you want to make sure that fees are limited, and that the issuer actually reports your payments to a credit bureau. College Students Can’t Handle Credit Card, Really? Can a Balance Transfer Lower Your Credit Score? What is Your Credit Card Philosophy? Of course interest rate doesn’t (I used a contraction, just for you — I really dislike the way they look) matter when you pay off the card every month. But I consider reality. In a perfect world, it would be nice if everyone paid off their credit cards each month, or if the credit rating system actually took into account truly good financial habits. This ideal world does not exist. Truth to tell, young people are going to get credit cards, and probably run up a balance, no matter what you, or I, or anyone else says, or how much logic someone busts out on them. But if one person saves a little bit of money, because they read this post and decided to go with the card with a better interest rate before making a big purchase they pay off over three or four months, I feel fine about that. Miranda, telling rookie card applicants to get a card with a “reasonable interest rate” is like telling 11-year olds to make sure they select a cigarette brand that’s low in tar and nicotine. You write “As someone without a credit history, you will have to pay a little bit higher interest rate.” No, you won’t. You’ll pay 0% if you can a) read where it says “due date” on your monthly statement and b) not buy things you can’t afford. Credit card interest is free money for the issuers, earned by exploiting the atrocious saving habits of the American public. Please don’t add to their ranks by telling them to take interest rates into account when shopping for a card. P.S. : It is OK to bust out a contraction once in a while. Gee them there gimmicks worked great (for them)! Most people are knee deep in credit card debit with no idea on how to get out because they were indoctrinated when they were too green to know what they were doing. Here’s some advice: just pay with cash – if you ain’t got enough – don’t buy it until you do. I remember a time in college when there would be people who would hand out free subway sandwich coupons to anyone who signed up for a credit card. These gimmicks are no way to get your first card. These are great tips. Thanks. 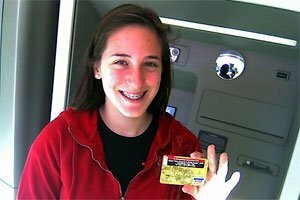 Most banks offer free “extras” for students with proof of a high school / college id card. This way they can start figuring out how credit cards work without getting huge fees their first time.